Need to find essential places located in the area? 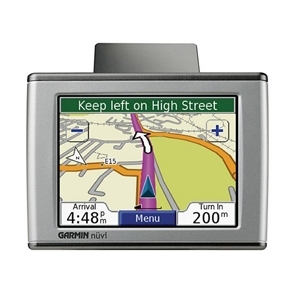 Garmin Nuvi 350 GPS Receiver is a very dependable Navigation system, preloaded with City Navigator version 7 which includes detailed maps of U.S., Canada and Puero Rico. There are two views: overhead in three dimensions and 2D map perspective. It’s easy to use, very accurate and provides decent signals most of the time. Nuvi 350 has a 3.5" diagonal, 320 x 240 pixel TFT screen with 64,000 colors, bringing a display that is so clean and crisp, whether it would be day or night. The Travel Kit includes Language Guide, MP3 player, audible book player, picture viewer, world clock, currency and measurement converters and a calculator. Navigation instructions and warnings are in both audible and visual formats. Weighing at 144.6 grams, it has a built-in lithuim ion battery that lasts between four to eight hours, still depends upon the duration of use. It also includes a 12-volt power adapter cable that can serve as external power while in vehicle. The size is small, easily fits in a pocket or purse, with dimensions 3.87" x 2.91" x 0.87." Some would argue about this gadget’s failure to update the time zone when it’s deem applicable. If one would travel in ET Zone, the estimated arrival time was always an hour behind because there’s no way to update the time zone automatically or manually. Nevertheless, this is still one of the best Navigation systems available.